Hope revived as Jackline Mwende Lands in Kenya with New Hands – Kenyatta University TV (KUTV). All Rights Reserved. Joy rent air at the Jomo Kenyatta International Airport on Monday when Jackline Mwende, a victim of domestic violence whose hands were allegedly chopped off by the husband, landed from South Korea with a pair of brand new arms. Mwende could not hide her excitement and proudly displayed her new pair of myoelectric arms which doctors say she will comfortably adapt to using in a span of two months. “I thank God. I am happy. I now have my hands back,” she said. 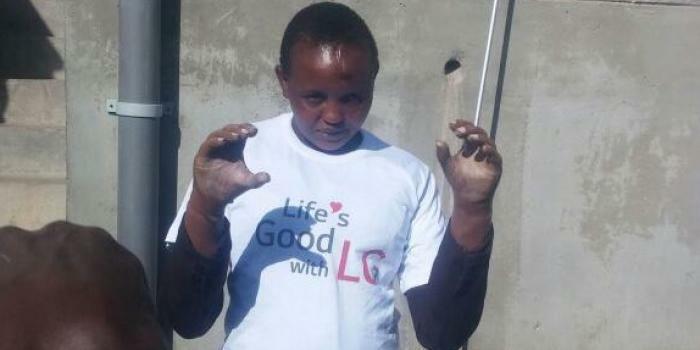 The 27-year-old was received by electronic company LG, which sponsored her surgery in South Korea and Machakos County, where she lives. She expressed her delight in finally being able to do some basic life chores after the brutal attack that had rendered her helpless. “Now I can go back to tending to my shop. I can continue earning my livelihood without having to rely on anyone,” she added. The arms, whose lifespan is estimated at 10 years, are fitted with a naturalistic brown glove matching her skin colour and one can hardly tell they are artificial. On July 24, Mwende was allegedly attacked by her husband, Stephen Ngila, who cut off her hands for failure to conceive a baby, seven years into their marriage. According to Ms Mwende, they had separated with Mr Ngila for three months and on the fateful day, her estranged husband showed up at her house and started attacking her with a panga. The brutality was sharply condemned in Kenya with leaders moving in to help her. She added that she will not consider remarrying. Mwende left for South Korea on September 26 accompanied by Ms Hellen Kanini, a nurse at the Machakos County emergency rescue team.